Los Angeles — Siemens and the South Coast Air Quality Management District (SCAQMD) are conducting a one-mile, zero-emission eHighway demonstration in Carson, Calif., near the ports of Los Angeles and Long Beach. Three big-rig trucks hauling freight are running along the stretch of highway that uses Siemens technology to electrify select highway lanes via an overhead catenary system. This catenary system supplies the trucks with electric power, similar to how modern-day trolleys or streetcars are powered on many city streets, and the system also allows for truck operation outside of the electrified sections of infrastructure. 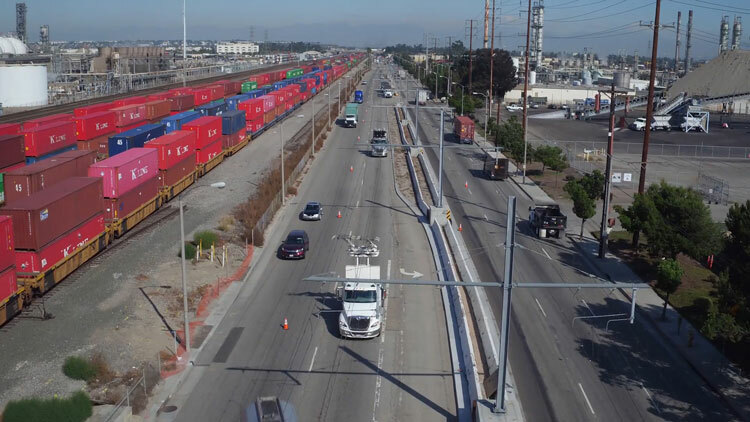 One battery-electric truck, a clean natural-gas hybrid-electric truck and a diesel-hybrid truck are now driving on a one-mile catenary system on the north- and south-bound lanes of South Alameda Street from East Lomita Boulevard to the Dominguez Channel in Carson. Siemens is dedicated to improving Californian infrastructure through technology — from commissioning combined-cycle flexible power plants in El Segundo that can power nearly 450,000 Californian homes and intelligent software that helps CAISO manage renewable energy, to Sacramento-built advanced technology light rail vehicles for San Diego and San Francisco and some of the country’s cleanest-running locomotives for the Capitol Corridor. Siemens also contributes to the local economy with an extensive footprint in the region including its over 1,000-person U.S. rail manufacturing and service headquarters in Sacramento and its next47 innovation hub in Silicon Valley. For further information on Siemens eHighway, visit www.siemens.com/ehighway. Watch a video at http://siemensusa.synapticdigital.com/images-and-videos/video/siemens-ehighway-broll/a/5a93d003-aba5-490b-88b0-66728d9e09f1.